This tower bimini is an exclusive innovative patent design! 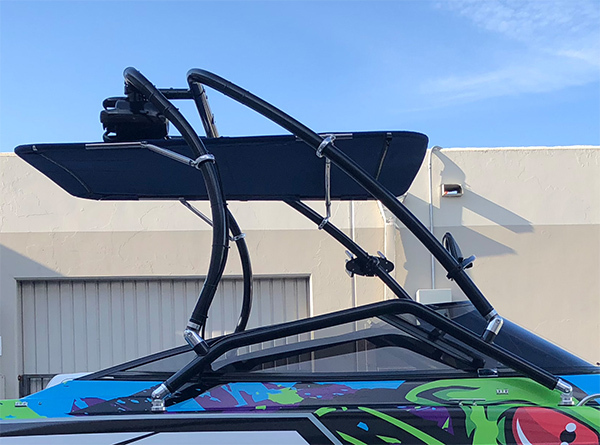 that is universal fitting to just about all standard wakeboard towers on the market. 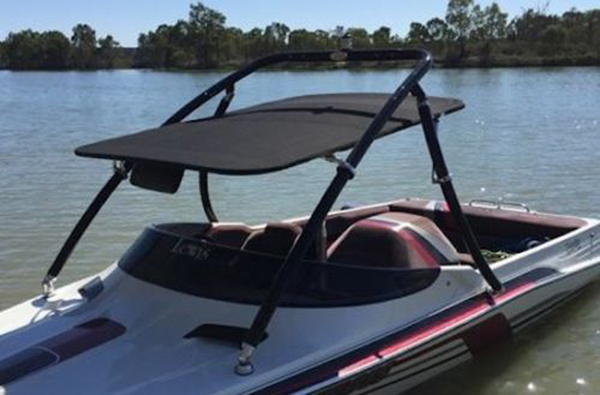 A Bimini Top which is fully adjustable to suit your tower. It is fully adjustable it can slide forwards or backwards for minor adjustments. The support arms can be at the front, rear, above or below for the right attachment required for your tower. The main cross bar is pin adjustable and will lock in strong between your wake tower legs. When towing your boat simply remove the cover via zippers and velcro, the frame is left in position. We use only genuine marine grade VIII, UV resistant material for our covers. The bimini frame is 1 inch bright dipped anodised alloy with thick walls. Fittings are UV treated nylon with stainless hardware. Measure across the boat between the front legs and between the rear legs across the boat at the height you would like you bimini to sit. Small 1.35m(W) x 1.9m(L) or 53in(W) x 75in(L). If less than 53inch, you have to install the tower bimini above your tower top, we recommend large size but you need to order a pair of lifting bracket as they are not included in the standard package. If above 82in, you cannot use this bimini, we recommend you Reborn Pro2 Extra Large Tower Bimini. This list is for 1580V. Clamps 2.5 inch, 2.25 inch and 2 inch tower leg outside diameters.